Wednesday, April 24, 2019 from 5:30 – 7:00 p.m. The Houston-Galveston Area Council will release the draft 2045 Regional Transportation Plan and transportation conformity documents for public comment on April 10. The long-range plan prioritizes spending on regional transportation projects, including short and long-range strategies, to ensure our transportation network is safe and efficient. Transportation conformity verifies that the regional transportation plan and the transportation improvement plan are in agreement with federal air quality regulations applied to our region. The official public comment period will open April 10 and close May 10. A successful metropolitan planning process demands wide-ranging participation of an MPO’s diverse publics and stakeholders. 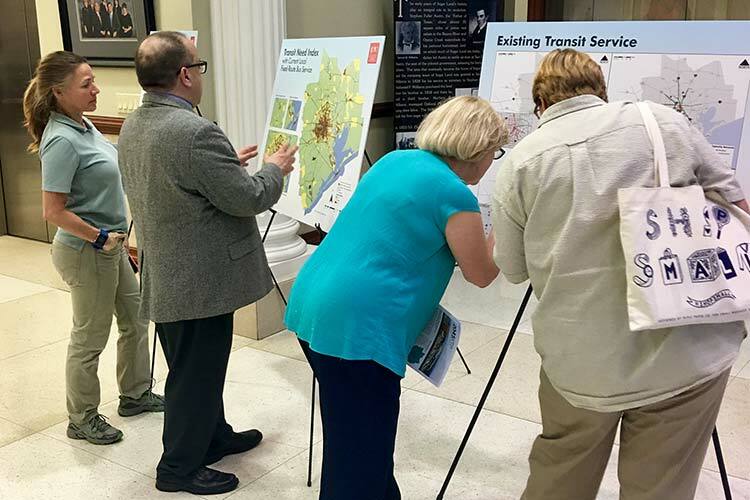 H-GAC regularly engages in conversation about our region’s mobility needs with the public and stakeholders for essential comment and feedback necessary for transportation planning efforts. Your voice matters. We want to hear your thoughts and opinions, and we welcome you to join the conversation by attending public meetings or exploring the website. If you are interested in additional information, or if you would like to request a presentation to your business or organization, click the link below to contact us. In the past few decades, the Houston-Galveston Region has surpassed the rest of nation in growth and development. 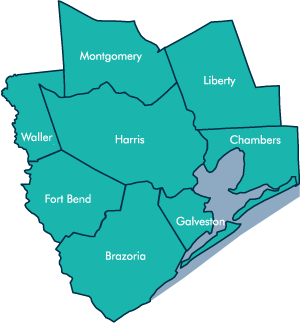 The region consists of 8 counties (Brazoria, Chambers, Fort Bend, Galveston, Harris, Liberty, Montgomery and Waller Counties) that are part of the Houston-Galveston Area Council’s Transportation Management Area. Currently, the region is home to more than 6.5 million people and 2.9 million jobs, and covers more than 8,700 square miles. Today, it remains its fast-pace growth and is rapidly becoming one of the nation’s most popular destinations. From 1990 to 2015, the Houston-Galveston region grew by 2.6 million people, bringing the population to 6.3 million people. This represents an increase of 69%. The net population growth and population growth rate of the region are in the top five among peer regions. In the past decade, the region grew by 1.49 million people, ranking first among all peer regions. In 2015, there were approximately 3 million jobs in the Houston-Galveston region, ranking eighth among all metropolitan areas in the US. From 1990 to 2015, the region gained more than 1.2 million new jobs, second only to Dallas-Fort Worth (1.4 million jobs). Other metropolitan areas adding more than 1 million jobs in this time frame were New York (1.2 million), Los Angeles (1.1 million), and Atlanta (1 million). The number of jobs in the Houston-Galveston region increased by 72% between 1990 and 2015. The rate of growth ranks fourth, behind Austin, Phoenix, and San Antonio metropolitan areas. 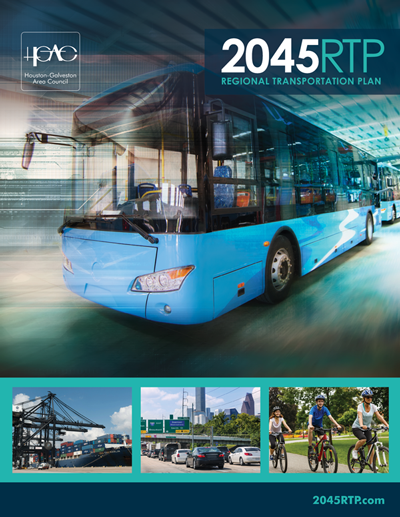 Why is the 2045 RTP Important to You? Vehicles travel nearly 180 million miles per day in the eight-county Houston-Galveston region. Residents travel to and from work daily. We take our children to school, visit family members across town, shop for groceries, clothing, and for other goods and services. The economy and general well-being of individuals in the Gulf Coast region of Texas rely on the ability to safely and resourcefully travel throughout our diverse area. The 2045 Regional Transportation Plan is a long-range plan that prioritizes spending on regional transportation projects, including short and long-range strategies to ensure our transportation network is safe and efficient. With an ever-present focus on safety, efficiency and reliability, the RTP highlights efforts to reduce traffic congestion and vehicle crashes, concentrates on asset management and operations, supports regional economic development opportunities, and maintains emphasis on transportation’s impact on the environment. A Metropolitan Planning Organization (MPO) is a local decision-making body that is responsible for overseeing the metropolitan transportation planning process. 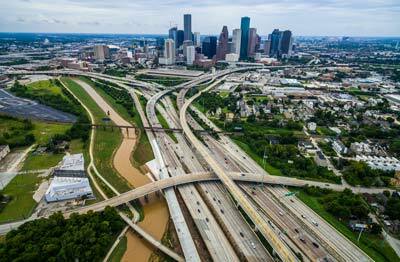 H-GAC is designated by the State of Texas as the region’s MPO for transportation planning in Brazoria, Chambers, Fort Bend, Galveston, Harris, Liberty, Montgomery, and Waller Counties.